I'm still plugging away at the knee pad covers. I worked up the backs, and am in the process of getting second front done. I think I would've been done earlier if I hadn't frogged the heart on the first front so many times. I just didn't like how I was working the intarsia pattern. The first time I frogged it, I didn't like how the stitches of the heart looked so tightly knitted compared to the rest of the front. The heart itself was starting to "bubble" in the middle and the edges looked too separated from the rest of the piece. The second frogging happened cause I was doing the normal knit to the color change, drag that yarn in the back 'til I needed it again. I didn't like how the backside looked so messy and gross. 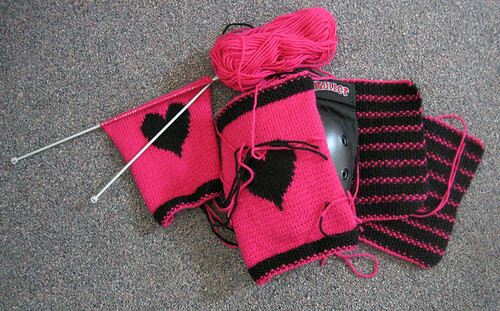 Not to mention that the carried over yarn didn't allow for much of a stretch in the first place and when it didn't stretch it distorted the heart shape. I needed the allowance of the stretching ability in the heart as this was going to be a piece that just pulls over the store bought knee pads. So I tried to re-knit the intarsia but this time leaving more slack in the carried over yarn to help the piece stretch more. Yeah...that just looked even uglier and more messy than before, and didn't really help out with the stretching issue. Then the thought hit me: what if I was careless in putting these on and the dragged over yarn got caught on something? Ugh. I had an internal argument about whether or not to leave it this way. But a feeling in my gut won and I knew I had to figure out a way to do the intarsia so that it could stretch without ruining the design and would also look clean in the back. Yeah, yeah, yeah, I know. Who's going to see the back?? Well, I'll see and I'll know! Anyways, I had no idea what to do, as I have only done intarsia work a few times...and those projects were tiny things like wristbands. Yet this is the only way I knew how to do intarsia and the only method I had come across in all my books and on the web. I am so glad that Google exists! There were various websites but none had any decent visuals...until I came across a tutorial on The Purl Bee site. Of course!!! Why didn't I think of going there in the first place?? I love that website, and always check it every second day. I'm rolling my eyes at myself for this one. After much examination of the photos and tips provided, I re-did the heart. And YAY!!! It worked out!! I'm so proud of myself!!! And the back is just so clean!! I was seriously jumping with glee at that. How sad, I know. The best part of it all? I learned something new! Anyways, I need to keep plugging away. I'm so close to finishing! Well, the knitting part at least. The next part is the step that I hate the most: weaving in the ends. I always try to find ways to knit/crochet something so that I don't have to weave in ends later. I decided that after this project is finished I'm going to give the crochet driving gloves another go. I won't be able to go to my knitting night tomorrow :( Brett will be working really late and in an attempt to save money we're trying to avoid ordering take-aways, which we normally do on Fridays cause that's when Brett's entire week catches up with him, when I'm at my knitting night, and Brett is alone with the munchkin for a few hours. So I'm going to see if I can make it three for three and make dinner again tomorrow night. I'm keeping my fingers crossed that Brett won't have to work late again next Friday...I always feel so guilty for missing too many knit nights!